With a nip of whisky for courage I’m heading to the west coast of Scotland to live off the land, find wild places and write. 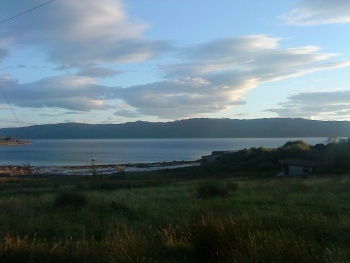 The view from the cottage, out across Loch Fyne to the Kintyre peninsula beyond. My garden has never produced more than a withered tomato or two, so the living-off-the-land bit could be a slightly foolish (dangerous?!) decision, but there’s a supermarket an hour’s drive away if the crops fail and I can’t bring myself to kill the goat. So what’s it all about? Well, it’s a punt at a freelance writing career. It’s a chance to live in the most beautiful place – I think – in the world. The west coast offers wilderness and I want to get amongst it. I’ll be swimming in mountain burns, walking to far-flung bothies and exploring remote beaches. And finally, it’s about following my dream – slowing down, spending less, catching crabs, diving for scallops, keeping chickens, knitting my own underwear. I’ll be writing about it all here. 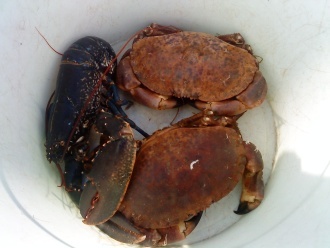 Two crabs and a lobster plucked fresh from the loch. The nice man next door says he likes catching them but doesnt like eating them. This weekend I’m ferrying my stuff to the cottage in a transit van. That’s the first challenge. How do you drive a van? There’s no back window! How can you see what’s behind you? I guess all will be revealed (or not). It’s just a flying visit – the real move is happening on 9 May, when spring has properly sprung. I’ll be in Bristol till then, saving for the lean times ahead and growing my veg seedlings ready for planting out in May. Yes, the potatoes are chitting as we speak. Talk to my friends and they’ll tell you that this isn’t a new idea. A move to deepest Dartmoor some years back lasted, err, a month, before I hot footed it back to civilisation. But it’s different this time, because I’m going to Scotland, which is, after all, my home.